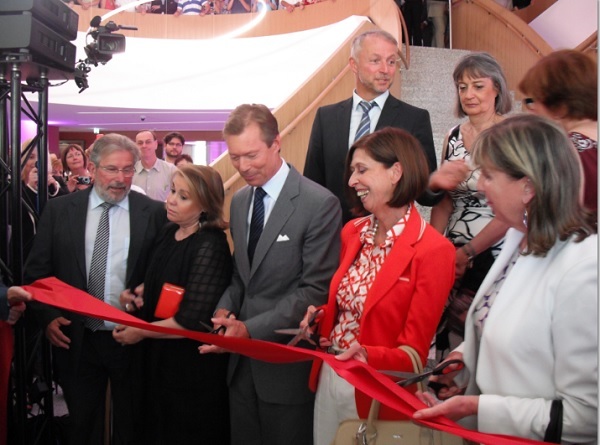 Today, Grand Duke Henri and Grand Duchess Maria Teresa were in Strassen to attend the inauguration ceremony for the newy renovated Grand Duchess Charlotte Maternity Centre at CHL. The facility, which cost €54.5 million, is being opened after three years of construction and will be directly connected to CHL's children's clinic. Grand Duke Henri and Grand Duchess Maria Teresa participated in a ribbon-cutting ceremony (pictured above) and were then given a tour. Also present for the inauguration were Minister of Healthy Lydia Mutsch, Speaker of the Chamber of Deputies Mars di Bartolomeo, and Luxembourg City Mayor Lydie Polfer, among other dignitaries. The new maternity centre will also be opened for a public preview on July 5th, with its official opening day for operations in August. For a little more about the inaugural event, see here.